A "tornado watch" is issued by the National Weather Service when tornados are possible in the area. A "tornado warning" indicates that a tornado has been sighted in the area, or is indicated on weather radar and that you should proceed to safe shelter immediately. If there is a watch or warning posted, then the fall of hail should be considered as a real danger sign. Hail can be common in some areas, however, and usually has no tornadic activity along with it. 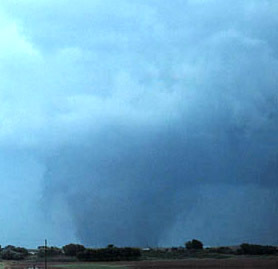 An obvious "funnel-shaped" cloud that is rotating, or debris such as branches or leaves being pulled upwards, even if no funnel cloud is visible. If Stetson learns of a tornado watch, we will send a notice via campus e-mail. If Stetson learns of a tornado warning, we will make every effort to send notice via e-mail, text message (for those who have registered on the Intranet), and phone announcement (via campus phones). If you learn of a tornado watch or warning in the Tampa Bay area, contact Public Safety in Gulfport at 727-343-1262 or Tampa at 727-420-8868. If you see a tornado, or are alerted to take shelter from a tornado, the areas below are recommended. Time permitting, it's best to get to an interior room without windows on the first floor. However, if you must go outside to enter one of these areas, you might be better off staying inside, moving away from doors and windows, and attempting to cover yourself. If at all possible, cover yourself with clothing, bedding or other protective coverings. If there is no time to escape or find shelter, lie flat in a ditch or depression and avoid areas subject to rapid water accumulation or flooding in heavy rains.